Last seen travelling down the funky soul highway at a filthy lick, Lexsoul Dance Machine turn a left turn at the crossroads in the direction of jazz-funk, latin and disco so they can shake their Coconuts at you. Their ultimate destination it appears is equal parts The Beginning Of The End, Chic and – er – Californian ‘nu-metal’ outfit Incubus in their more acid-jazz moments – viz. the latter’s Summer Romance (Anti-Gravity Love Song). Blimey! It’s enough to drive you coco! 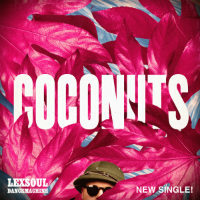 This is dope…I love coconuts! Renegades Of Jazz video glitch-hop psych Record Kicks BBP Chart ghetto funk Morlack Jalapeno Records hip-hop Free download Badboe disco Jazz Remix latin 7" Bulabeats trip hop Ewan Hoozami Fort Knox Recordings Breakbeat Paradise The Allergies Fort Knox Five review reggae Rory Hoy vinyl Dirty Dubsters Soul nufunk Electro swing Mr Bristow breaks Funk Basement Freaks Smoove Tramp Records vinyl 7"